It has been over a year, and what a year it has been. Fortunately I don’t have to go into any of that here. The TV project has all but died. I still have the spare PCB kicking about, but I’ve not got the motivation to fix my BusPirate probes and try to add USB to my TV. The Rasperry Pi2 is out now, and I don’t think my TV could supply enough current regardless. So one rainy day I might look into this again, but for now – everyone plays guitar, right? As this post is going to deal with the guitar pedal project I think we should go over some history. The MP-01 design was released 6th July 2013 (wow, that was a long time ago). It used a single PIC32 with external SPI DAC and ADC. Due to quite a lack of foresight, the rotary encoders were not on change notification pins, and any rail noise was put straight onto the guitar signal. That was a major issue that resigned this version to the junk pile, and the less said about this the better. MP-02 was to be the savour. The design for that was released almost 1 year ago to the day (tomorrow in fact). I learnt my lessons from the first design. The op-amp stage was re-architected to utilise the op-amps supply noise rejection capabilities. I’d been hit by scope creep quite severely by now. I had moved to a 2-PIC solution; a PIC24 to handle the non audio functionality (which went from just LEDs to include an external port for an expression pedal and USB to allow direct loading of patches from a PC), and a dsPIC33 to handle the real-time audio activities (using it’s in-built ADC and DAC along with the rotary encoders, footpedal switch and EEPROM). After building the pedal I had real difficulties getting the thing to work as I expected it to. For some reason I just couldn’t sample quickly enough and there was still far too much noise. I finally fixed the sampling issue by changing how I was clocking everything, and I was having a pedal that was actually passing the guitar signal through, albeit with a lot of white noise on top. 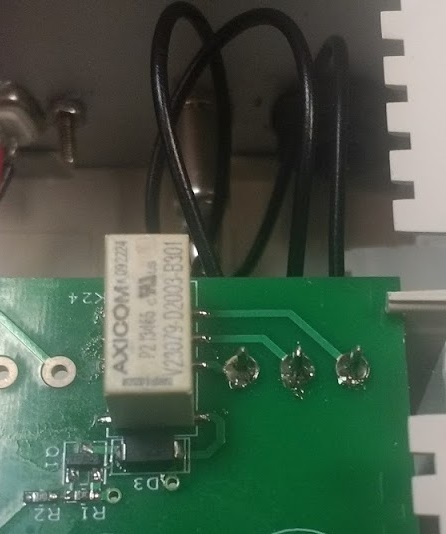 This noise was causing me some heartache as I just couldn’t pin down what was causing it; poor layout, inherent ADC and DAC noise issues, op-amp selection, dodgy power supply. I was fighting against so much that I decided that enough was enough. Plus I blew up the dsPIC twice as apparently the metal enclosure is made of metal. MP-02 v1.1 was to be the savour! I refused to play any more games. The dsPIC range do have inbuilt ADCs and DACs but they just can’t compete against a proper chip. So I enlisted the help of something made for audio; the Wolfson WM8731. This blows the 10 and 12 bit capabilities of the dsPIC out of the water with a whopping 24bits at 192kHz. It supports pass through of the audio without requiring it to even enter the dsPIC. We have volume control, anti-thump mute, and filters coming out of our ears. This is definitely going to go some way to helping the sound. The LMV321 op-amps are out. I looked over the specs and the limited slew rate is fighting against us. 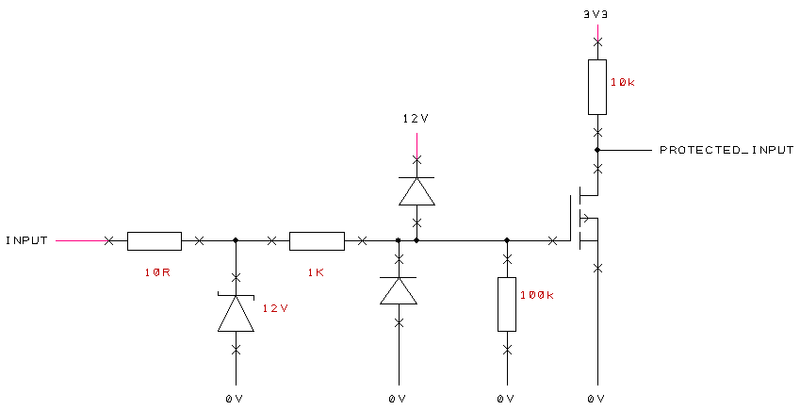 I am looking at a couple of different op-amps to use instead, and I am favouring the LMV793. A slew rate of 24V/us (instead of 1V/us), and a noise density of 6.2nV/rt(Hz) (instead of 46 nV/rt(Hz)) means that this pedal will be singing. I’ve added some external SPI SRAM into the mix too. At 512Kb we have enough storage for over 5 seconds of audio (16bit mono 48kHz). This doesn’t sound a lot but it is more than enough for a decent echo. Plus unlike EEPROM, SRAM can be written to again and again and again… I’ve still got the EEPROM though, boosted to 512Kb too. This allows me to bootload both the PIC24 and dsPI33 from SPI or UART without having to support the entire USB stack in the bootloader. Scope creep got me again, and now we support USB OTG. This means that whilst you can plug the pedal into a PC to download new patches, you can download from your phone instead or use that as an expression pedal, or simply plug in a USB memory stick to load patches directly. This just opens up the possibilities. Finally I’ve added filtering and protection. I probably could’ve added extra but it will hopefully that will be enough. These changes complicated the design no end, but I still managed to get everything on two layers (this may be the problem, we shall have to see), within my 50x100mm outline, and mostly single sided population. I want this pedal to be silent, as well as whisper, sing, and scream. I’ve done all I can to help with this task from additional components to filter the noise to segregation to help keep any noise where it can do no harm. I’ve even gone to a dedicated audio chip. This marks the beginning of the end of my attempt to design a guitar pedal. All will be revealed in a week or two when the new design gets posted through the door. I have been fairly lax in updating this website, but hopefully the next post will bring good news. I have three problems that I need to tackle; USB, 3x HDMI ports, HDMI-CEC. So again, lets head to the service manual to avoid embarrassment. 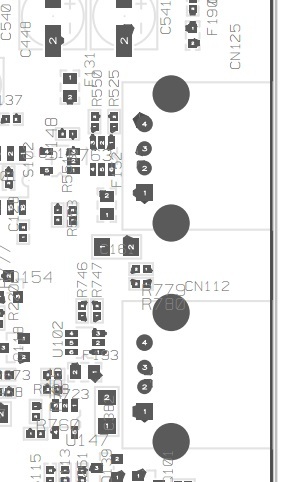 There are footprints for 2 USB connectors. Even though I don’t want to plug a memory stick in, it did pique my interest as to the differences. The top-most connector (CN125) is labelled DIGITAL_USB, as opposed to the plain USB of the bottom connector (CN112). 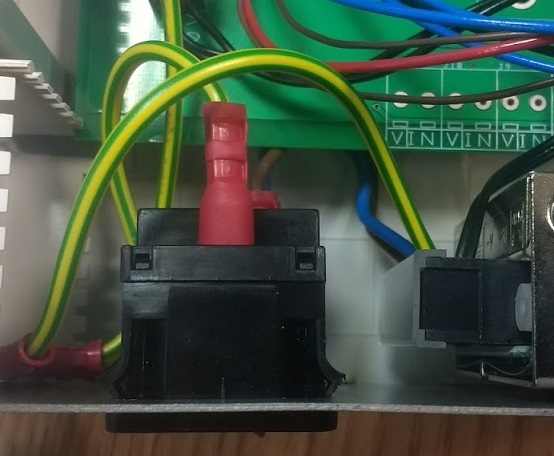 Neither of the connectors have a direct connection to the 5V_VCC rail, but instead go through an IC labelled STMP2161. On my spare PCB this part is missing (as I expected), and I couldn’t find a datasheet or anywhere to get one from. Thankfully, the part has both pins and nets labelled, so it isn’t too difficult to at least identify the function of the part, allowing a suitable replacement to be found. The device features ENABLE and FAULT pins, of which the FAULT pin is connected to a net labelled USB_OCD. This device is probably a current limited load switch (OCD being short for Over Current Detected). Tests have shown the Raspberry Pi has a maximum current consumption of between 500-600mA. This is just a guess, but I doubt that the STMP2161could handle 600mA, so if anything I am lucky that I have to source my own current limited load switch. Failing that I could bypass the switch circuitry and use a resettable fuse instead. Back to the differences between the two connectors. the DIGITAL_USB goes to a CT216T-R – the Cheertek Integrated DVB-T Receiver. Given this device has digital video and audio decoding capabilities, it is likely that the DIGITAL_USB connection would be used for playing video from a memory stick. The plain USB connector goes to the MST6WB7GQ-3 – the main MSTAR microcontroller. This is the brains that bring everything together. 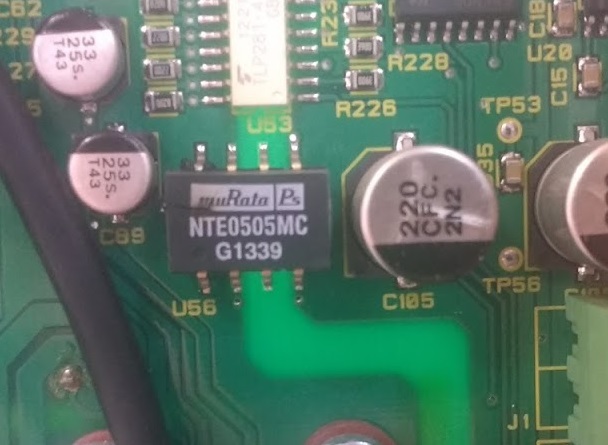 I couldn’t find any other information about the MSTAR processor, or its USB capabilities. The service manual makes reference to an “Analog USB” port which I didn’t even think was possible. 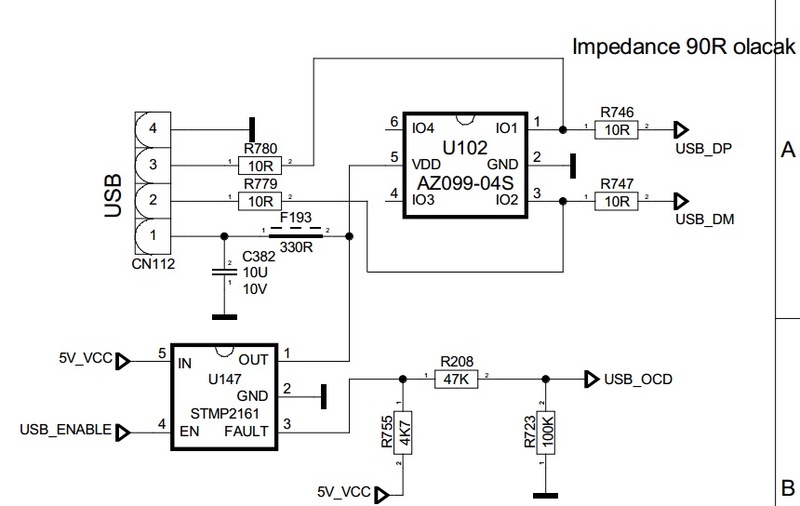 Enabling the power for the DIGITAL_USB connector is easy, but I wonder how much work would be involved in getting the actual USB data side to work. I am going on the presumption that all MSTAR microprocessors go out the same, and it is just a configuration page in external EEPROM that enables the features. This idea explains a number of things found in the Service Menu (found by pressing 4725 whilst in the TV’s menu). Firstly, there are options for “Digital USB Hotplug”, “CEC Enable”, HDMI3, HDMI4 but they are all greyed out. Secondly, there is the ability to modify NVM (non-volatile memory) data. I think that modifying the correct byte in NVM will enable the greyed out features. Before I modify the NVM, it makes sense to make a backup. But first I need to find the NVM. Hunting for NVM on the schematic leads to a net labelled SCL_NVM. This is an I2C clock line for the NVM device, in this case a Microchip’s 24C32. Admittedly, I’m getting a bit ahead of ourselves, but it is obvious how the building blocks all come together and what started as a horrifically complicated design is getting simpler. Back to the USB, and there is another unidentified device – a AZ099-04S. 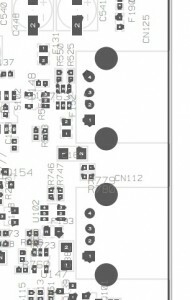 I am guessing this is probably something to help with ESD – maybe an array of bi-directional transient voltage suppressor (TVS) diode clamps. 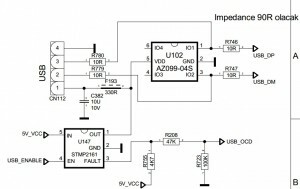 The last interesting part of the schematic is “Impedance 90R olacak”. USB is a differentially driven bus with a characteristic impedance of 90 ohms, and olacak is Turkish for “it will happen”. 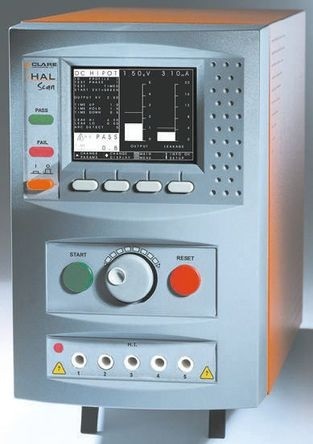 As to why there are Turkish instructions of the schematic, Vestel is a Turkish firm. Jobs before the next post are dump the contents of any EEPROM on the board. This includes the main NVM EEPROM (U103) that hopefully enables features, and the VGA EEPROM (U112) responsible for identifying the TV as a PC monitor and presumably including EDID (Extended Display Indification Data). Additionally, the HDMI switch contains an EDID table that should be visible over I2C. There are two I2C flash chips; one on the MPEG decoder (U114), and one on the main microcontroller (U132), that can also be read. Guitar pedals are harder than they look – at least this one has been. I’ve learnt some valuable lessons that I’ve never had to worry too much about before. The most valuable lesson is that noise is not fun. Living in the digital domain is brilliant because is it far less affected by noise. Analogue is the complete opposite. If you remember from last time, I had to bias my guitar input at Vcc/2, so that I could feed it into my first op-amp. This meant that any noise present on the voltage rail was put straight on my input, and amplified – not a good start. Thankfully, all is not lost as I just need to convert the input stage to an inverting op-amp with the reference set on the non-inverting input. It should just be a case of moving a few components around as I has enough forsite to scatter passives around the op-amp. In the meantime I want to talk about my TV. It is a low-end 32inch LCD Hitachi with IO that fits the price tag – no USB, only 2 HDMI, Component, Composite, and VGA. It’s pretty basic, but it fulfils MOST requirements of it, and was a bargain when we bought it. However, over the last two years my needs have changed, but I cant justify buying a new TV. I’m sure modern TV’s are extremely complicated, but like all good hackers/engineers, I needed to know just how complicated. More than a few years ago I would have just taken the back off and gone oscilloscope crazy, but I’ve learnt my lesson by poking around inside said oscilloscope so instead started with the service manual. In fact I started by searching for spares for my TV (Hitachi 32LD30UA). That gave me a part number of my main control board – the Vestel 17MB35. I can only assume it is a popular control board, purely based on the amount of information I can find about it. Amazingly I found a service manual on the ArgosSpares website. I don’t know why I say that’s amazing, as Argos is where I bought the TV, but I didn’t expect to find a service manual there. 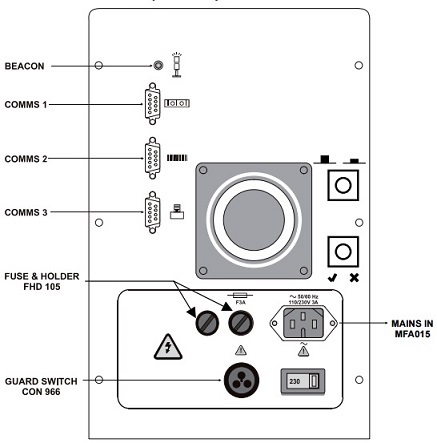 Anyway, hunting through the manual I found out that my control board should have footprints for 4 (not just 2) HDMI connectors, 2 USB connectors, and even a “Ye Olde” DSub9 connector. Thinks were looking up, as I needed a USB port just to power my Raspberry Pi. I have been tempted to open the back of the TV and piggy-back off of a voltage regular, but not all I need to do it fit a USB socket instead – a nice and clean modification. At this point, I still haven’t actually opened up the TV, but I have ordered and received a spare control board. I figured when I eventually open the TV I can copy the contents of my TV’s EEPROM into this board, and see what happens when I switch them over. My aim is to have the Raspberry Pi powered from a USB port on my TV, have a third HDMI channel, and enable HDMI-CEC. I am pretty confident in the USB power, but who knows about the rest – wish me luck. This entry was posted in Hardware and tagged buspirate, guitar pedal, hardware, opamp, TV on September 6, 2013 by admin.